In the above Act 4, scene 1, 148-158 of The Tempest, Prospero in preparation for Miranda’s wedding to the Prince of Naples stages an entertainment with spirits taking the parts of Roman gods. He abruptly stops the fun. He tries to calm Miranda and Ferdinand explaining that what he has stopped was simply an illusion that will disappear into the thin air. We are such stuff as dreams are made on is one of Shakespeare’s most often misquoted quotes. Made on is usually changed to made from. In a bout of insomnia I thought about it most of Saturday night.I kept re-living Morgan's Prospero in Friday night's The Tempest at Bard On the Beach. A few weeks before in Midsummer's Night Dream I was sitting a few seats away from actor/director Sarah Rogers. She smiled and made faces at me. I remember that when I was 8 and 9 my friend Mario from across the street would come to visit me to play. On sunny days we played in the garden with swords or Gene Autry cap pistols. When it rained or it was cold and cloudy we would move into the house where in a long hall we would play with toy soldiers that, more often than not we converted to simple civilians. These people worked and had love lives. We put couples to bed and they did whatever we at age 8 thought couples did in bed. There was an issue of the National Geographic that my mother had brought from the American School where she taught Physics and Chemistry. On of the articles featured the Statue of Liberty and Ellis Island. Another had these American football players in player’s uniforms. I was amazed by their almost super-human shoulders. For reasons that escape me Mario and I played a game called Columbia. This was a small but powerful island nation peopled by broad shouldered giants who worshiped a goddess (the Statue of Liberty). It was only a few years later that I caught on that the shoulders were padding and that there was no island nation called Columbia. When 8 or perhaps 7, I went into our back garden galpón (shed) where there was a large wooden box. In it I propped four bricks so as to have a gas pedal and a brake pedal. With a broom and a wheel on its end I had the steering wheel. I placed a board across the box and presto I was sitting in a racing car and I was Fangio. Somehow the car was real and I was driving a racer. But one day I could not conjure any of it and I gave up. The racing car had disappeared. Soon Mario and I stopped playing our games and we began to collect round estampitas (cards) of the football players in Buenos Aires. Our make-believe games ceased and we through our cards to as close as we could to the edge of the sidewalk where it met the walls. This was our first taste of gambling as we might sacrifice a valuable card from Boca Juniors to get an even more valuable player card from River Plate. Last night I thought about the difference between made on and made from. I concluded that our wakeful life depends on, leans on, and emerges from, derivates from our make-believe-imagination-dreams. Since the world of make-believe is most active in childhood I suspect that it prepares children to cope with the reality of adulthood. This brings me into two ideas of which one is not a very pleasant one. I am 71 and my dreams now seem to be more intense. Because I get up several times during the night I remember more of them. Their logic escapes me and I wonder if this may not simply be a manifestation of my returning to that childhood. Could it be a forewarning of dementia? The other idea is far more pleasant. In my years of taking pictures of actors and actresses (I cling to that world because I am an old-fashioned remnant of the last century) I have never tired at their ability to fall into parts and in many cases to cry on demand. At the same time become saddened at witnessing modern dance or a 17th century baroque sonata that I know I may never see or hear again. The same happens to every evening’s performance of a play. It fades into “thin air”.Do we remember that Allan Morgan appeared as Prospero in Bard production (also directed my Meg Roe) in 2008? I still remember the remarkable performance of Angels In America in 2006 at the Waterfront Theatre on Granville Island. The actors were Sarah Rogers, Allan Morgan, Dennis Simpson and Marco Soriano. 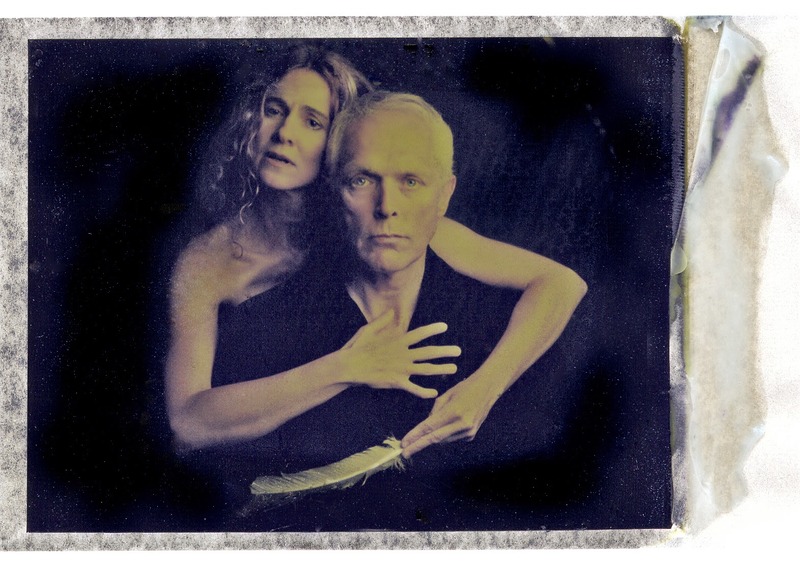 The performance has been with me since because Sarah Rogers and Allan Morgan came to my studio to pose for a picture that appeared in the Georgia Straight. It seems that actors make-believe professionally while dancers and musicians perform ephemera. A painter will paint and will have a painting. The same applies to a sculptor. A traditional film photographer will have prints, negatives and slides. The digital photographer’s images approach that fading into thin air with a corrupted file, or the infinitesimal thickness of a computer monitor. Every morning I wake up and take time to focus on which show I will be performing that evening so that throughout the day I'm "tuned up" with the character and the dialogue. The real preparation begins when I arrive at the tent, about 2 hours before the show which gives me plenty of time to run lines, go over fight and dance choreography, get make-up and hair sorted. By the time I'm being laced into Beatrice's corset, or putting on all Cleopatra's gold jewelry I am more than ready to step onto the stage as one or the other. It is either the corset or the gold jewelry that settles Lines to her part with no confusion. My conclusion after hours of twisting and turning in bed is that actors in good plays allow us to play make-believe games. Some of us may laugh and enjoy the special staging effects. Some of us might like the music and the songs. But some of us (me in particular) can never forget how these actors in their talent and style force us (ever so gently) to imagine, to dream and to reflect with the words of the playwright and the intended bearing of the director into keeping us young, almost children so that we can become more human (as Harold Bloom so insists). I have often wondered why playwrights who write plays are not playwrites. My personal conclusion is that the playwright, the good ones of which Shakespeare is one of the paragons of the craft, simply knows how to play the game. Playwrights know how to play the game of the imagination and of the dream. They play right, as do our Vancouver actors we are so lucky to have and enjoy. And only today as I looked for the image of Allan Morgan and Sarah Rogers did it occur to me that it also makes a perfect portrait of Prospero with Ariel.